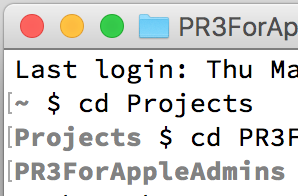 They appeared first in Terminal in El Capitan (10.11). They are called ‘Marks’ and simplify scrolling through the output in the Terminal window. By default, every command that is executed automatically gets marked. You can quickly scroll the Terminal output to previous marks (i.e. command prompts) with ⌘↑ (Command-Up Arrow) and to next mark with ⌘↓ (Command Down-Arrow). This allow you to quickly skip through the command prompts in your window. You can quickly select output between Marks. ⌘⇧↑ (Command-Shift-Up) will select the output up to, but not including the previous command prompt. ⌘⇧↓ (Command-Shift-Down) will select the output up to, but not including the next command prompt. 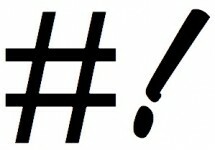 When you repeatedly hit this key combo the selection will be extended further, including the intermittent command prompts. ⌘⇧A (Command-Shift-A) or ‘Select Between Marks’ from the ‘Edit’ menu, will select to the previous mark, if you are the last (empty) command prompt, otherwise it will select to the next mark. You can also just remove the output of the previous command with ‘Clear to Previous Mark’ from the ‘Edit’ menu (⌘L). This is less destructive than clearing the entire screen or buffer. Marks are very useful. However, they are all the same, so jumping back to a specific mark in your Terminal scroll buffer will get harder and harder you have to hit ⌘↑ more and more often. You can elevate a mark to a bookmark, which will allow you to jump directly to it. Jump to the line you want to bookmark or select some text and choose ‘Mark as Bookmark’ from the ‘Edit’ menu (⌘⌥U) or context menu. Bookmarks have a bolder vertical bar ‘|’ at the left and right edge of the window. You can jump to previous and next bookmarks with ⌘⌥↑ and ⌘⌥↓, or you jump directly to a bookmark from the list in the ‘Edit’ > ‘Bookmark’ menu. The ‘Edit’ > ‘Bookmarks’ menu also has ‘Insert Bookmark’ and ‘Insert Bookmark with Name…’ items. These will mark the current command prompt as a bookmark, and give you the option of naming the bookmark, rather than having the default timestamp as the name. Terminal will set an automatic bookmark when restoring a Terminal window (after a reboot). This setting is controlled in the ‘Resume’ area in the ‘Window’ Tab of the Profiles area of the settings. If the grey brackets indicating the marks annoy you, you can hide them with ‘Hide Marks’ from the ‘View’ menu. This will only hide the marks and bookmarks, they will still be automatically (or manually) created and you can still jump to them. You can disable automatic mark creation entirely by deselecting ‘Automatically Mark Prompt Lines’ from the ‘Edit’ > ‘Marks’ submenu. When you have disabled automatic marking, you can execute and manually mark a prompt with ⌘↩︎ (Command-Return). With automatic marking enabled, you can execute a command without marking with ⌘⇧↩︎ (Command-Shift-Return). You can also manually remove a mark, by scrolling or jumping to it and choosing ‘Unmark’ from the ‘Edit’ > ‘Marks’ menu or the context menu. alias mark="osascript -e 'if app \"Terminal\" is frontmost then tell app \"System Events\" to keystroke \"u\" using command down'"
alias bookmark="osascript -e 'if app \"Terminal\" is frontmost then tell app \"System Events\" to keystroke \"M\" using command down'"
The downside of this approach that the aliases do not work when Terminal is in the background. This is brilliant! Exactly what I was looking for to be able to select output of commands.